When planning to build your dream home you need a reliable team of trades' people to ensure the house is built on time, to plan and to the best possible quality. General labourers are easy to find; friends, family and neighbours are always keen to roll up their sleeves and lend a hand. However, will they be a liability on site? Will they follow your instructions or treat the build as a joke? Can you sack them if their work is not up to scratch? When you are really stuck for labouring help put a notice up at the entrance to the build, someone will soon apply for some casual work. Remember to get a receipt for any money paid out for casual labourers. 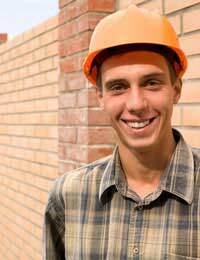 Most colleges of further education have courses for the construction industry. Contact the tutor in charge and ask if anyone requires work experience. Technically you do not have to pay these students although everyone should receive a fair wage for the work they provide. You will be also be providing an invaluable service to young people studying for their trade. You will soon make contact with other self-builders, be it on forums or by word of mouth. Some may not have started their own builds and will be willing to lend a hand on your site on the understanding you reciprocate the offer later. Your architect would have worked with many building trades' people and can recommend the best. Take his advice by all means but check out their work before hiring them. There are agencies that have building workers on their books. For some self-builders this is an ideal way to employ staff on a day rate. You will only have to pay the agency and if a worker is unsuitable you can notify the agency rather than fire the person yourself. The downside to using an agency is the amount they charge, as they will add their own commission on top of the rate paid to the worker. You will be working to a tight budget this money could be better spent elsewhere. The local Job Centre may be able to find you the right kind of worker; they will sift through applicants and send you staff to interview. The Job Centre being government owned does not charge a fee for this service. When interviewing any applicant for a job on your site always ask to see their qualifications. Never accept a person's word that they have had the relevant training. Also, check that their trade association details are up to date. Heating and plumbing engineers will have cards stating they are Corgi registered, similar applies to electrical workers and other skills. When employing workers ask to see work they have done elsewhere. Bricklayers particularly can point out buildings they have worked on that you can view, so can plasterers - these peoples' work is going to be the most prominent in your home so you need to make sure it is visually attractive. Also state the hours you wish to employ these people as many will set their own terms and you do not want to see the site empty at three in the afternoon when you have paid for a full days work. You set the times not the contractor. You must have the nerve not only to instruct anyone working on your site but to also be able to sack him or her if their work is not good enough. If you are not able to do this consider employing a site supervisor who will be able to get the best out of the workers and take the responsibility off your hands - but could you dismiss him if he is not up to scratch? All contractors should carry public liability insurance. Keep a copy of all documents on site in case there is a query or problem. Keep a log of all payments made to site workers and if paying by cash ensure that a signature is obtained before handing over any money.